I know how God works. Or perhaps I should say I know what the Bible says about how God works. Trying your best to follow the rules alienates you from God. In fact, it will kill you. That doesn’t mean there is no room for obedience in your life in Christ. Rather, it means that your relationship with God relies entirely on God’s grace, and it is to be marked by obedience to him. The work that comes out of you is because of the work God does in you. This is nothing new for those who belong to God. It’s the way he has always worked through his people. There are two actors in this passage, but note who is the one responsible for accomplishing God’s purpose: Abraham was chosen so he would direct his affairs in a godly way, yet God himself is the one who brings about the fulfillment of his promises. Just like Abraham, God chose you for himself so that he will bring about for you what he has promised. And just like Abraham, you are to direct your life in a Godly way. How can you do this? Again, it is all by God’s grace working in and through you. Following the way of Christ does not bring the grace, but rather his grace makes obedience possible. Your actions do not achieve your salvation. 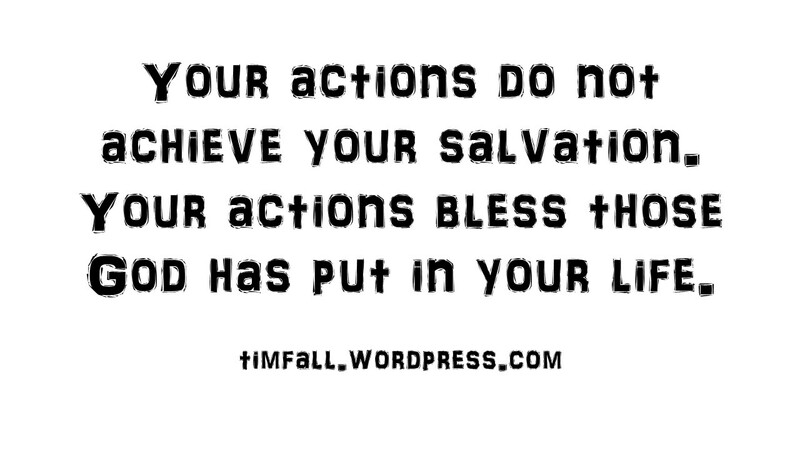 Your actions bless those God has put in your life. That is the kingdom work God has always had for his people. Bless the lives of others as you live in God’s grace. This entry was posted in Uncategorized and tagged Abraham, earning salvation, faith and works, God's grace, God's promises, law and legalism. Bookmark the permalink. I really like that verse about Abraham — which I’d never really paid attention to before — and how it delineates what is God’s responsibility and what is Abraham’s. I think we often get the 2 mixed up and try to do what just isn’t ours to do or what we can’t possibly do. When I try to take on God’s job there is disappointment to say the least. Disaster more likely. Well put. Works based salvation is just another way of feeding that selfishness that we each have within us. You could perform what is seemingly the most selfless act in the world, but if the mindset is that it is putting some marker on your side to achieve your salvation, it becomes just another selfish act. Well said, We either do things for the glory of God or they are worthless.